Note to readers: It's been more than a quarter-century since one door slammed shut and another eventually opened wide for dean of D-FW sports anchors Dale Hansen. This article, first published on March 22, 1983, recounts his last day at KDFW-TV (Channel 4), then a CBS affiliate. Shortly after, he hooked up with WFAA-TV (Channel 8), which promoted his arrival with commercials that showed him taking a quick cab ride across town. "Yes, Dale Hansen is moving up to Channel 8," an announcer trumpeted. Last year he signed a new, long-term contract with WFAA8 that will give him 30 years at the station when it expires in 2013. Love him or loathe him, Hansen's firmly plugged in. Dale Hansen, Channel 4's colorful 6 and 10 p.m. sports anchor, has been told to fly his colors elsewhere. News director William Wilson fired Hansen Monday afternoon for the second time. In May, 1980, Wilson had dismissed Hansen at KMTV-TV in Omaha, Neb. Wilson became Channel 4's news director in September 1982. "There is absolutely no relationship between that time and this time," Wilson said of the firings. "Dale and I have seriously tried to get along, and I think we have. I happen to be the unlucky guy who gets to do this twice. And I hope to God I never have to do it again." Hansen, reached at his home in Roanoke, Texas, said he was scheduled to leave Friday on a two-week trip to cover the Texas Rangers in Florida and the NCAA baketball tournament in Albuquerque, N.M. if the University of Houston made the Final Four. When he was called into Wilson's office Monday, Hansen said he assumed it was to renew his contract, which expires April 26. "Then he (Wilson) leans back in his chair, and my gut left me," Hansen said. "I knew I was gone. I told him, 'Well, we're two for two.' I walked out of the newsroom saying goodbye to everybody and they thought I was on one of my kicks. They didn't believe it." Hansen, who has been at Channel 4 since August 1980, was not on the air Monday. Bret Lewis anchored the 6 and 10 p.m. sportscasts, and will anchor at 5, 6 and 10 p.m. weekdays while station management interviews replacements for Hansen. Wilson and Channel 4 general manager John McKay said Hansen was dropped because he caused too many problems. "It's been two years of Dale and the station management in a virtually continual adversarial relationship," McKay said. "Some months were better than others, but Dale chooses to do things his way. This is a team effort and Dale has trouble with team sports." McKay said Hansen's firing was "Bill Wilson's call, in concert with me. I support Bill's position." 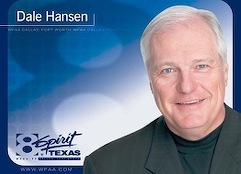 Hansen is being dropped just a week after Channel 4 recorded its best performance in the Arbitron and Nielsen ratings. In the February sweeps, the station easily won the 6 p.m. ratings race and edged Channel 8 at 10 p.m. Channel 4 also won the 5 p.m. news slot. "Yeah, Dale's part of that (the success)," Wilson said. "He's part, but not all. We feel that in this particular case, we want to take the option to search for another team player. The sense I get is that Dale has had difficulties with the direction here, and that he probably would like the opportunity to look elsewhere. The impression I've got is that he's got something else in the fire." Hansen said he had a definite job opportunity last December, when he was offered $87,000 a year to anchor sports at KTPV-TV in Los Angeles. Hansen said he decided to stay with Channel 4 after being assured he would have his contract extended. "Fire me if you want to fire me, but damn, just deal with me straight," Hansen said. "I could have packed my bags and been working in L.A. And that's what upsets me. They've got a right to fire me if they're unhappy with my stupid jokes and my bozo antics on the air. But I'm very unhappy that they're making it out that I'm this big troublemaker. "I honestly believe I was a team player. I gave it a helluva shot with what I had to work with. The station has the pure-and-simple philosophy to promote and get the ratings. Given what I was given to work with, I tried to put on something that would make people tune in. I believe I did. Say what you will, but the ratings were there." "I've got things in the fire," Hansen added, "only because I expected this when Wilson was hired. I wasn't stupid this time. I have money in the bank, and I've made contacts. But I've been loyal to that station. I'm very upset by being fired. I had no desire to leave Channel 4." Hansen, 34, originally was hired to anchor the 5 p.m. sportscasts, but he quickly was named to replace Knox Nunnally as the 6 and 10 p.m. weekday sports anchor. 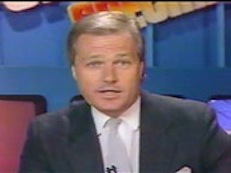 Hansen's sportscasts were a combination of information and entertainment. "I look at my job as a little more entertainment than some people in the business," Hansen said in an earlier interview. "I'm always looking at it with humor in mind. I don't get hung up with that word 'journalist.' I have more fun. Sports fans just get so pissed off when they hear this. I'm very comfortable sliding into the entertainment side of my three to four minutes, and that drives the hard-cores crazy." His "entertainment" included frequent accounts of his antics on the golf course. He also occasionally wore hats and other paraphernalia. Hansen will be paid for the one month remaining in his contract with Channel 4.